Fabulous Frannie Multi-Surface Cleaner combines 100% pure essential oils and natural cleaning agents to keep your home surfaces fresh and clean. 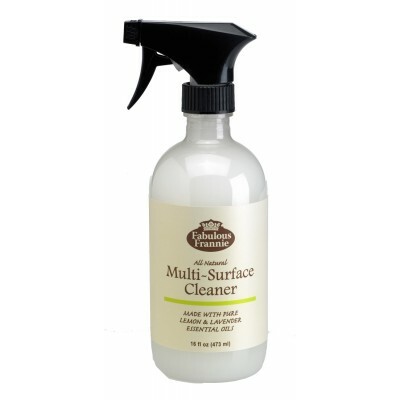 This multi-surface cleaning spray kills bacteria, removes dirt and fights germs while providing an uplifting scent for you and your home. Recommended for non-porous surfaces only, including appliances, bathroom fixtures, composite stone, finished wood, laminate countertops, sealed granite and tile. Cleaning has never been this safe and easy for you and your family! Shake Well. Spray surface and wipe away with a clean cloth. Water, Sodium Borage (Borax), Olea Europaea (Olive Oil), Potassium Hydroxide, Citrus limon (Lemon Essential Oil) and Lavandula officinalis (Lavender Essential Oil).